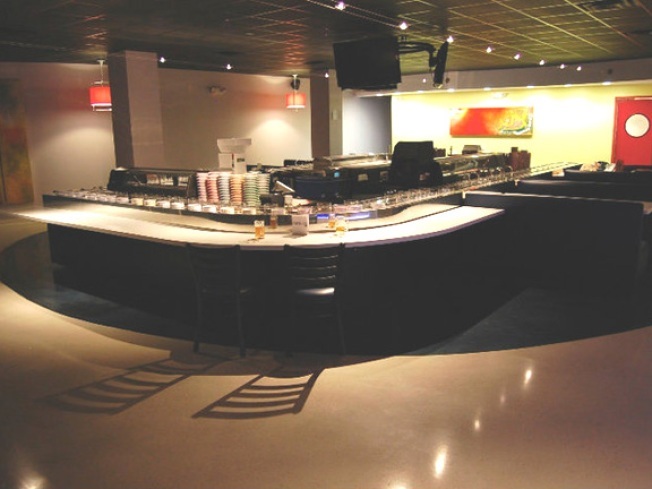 Umi sushi is the first conveyer belt sushi in the state. Imagine small plates of sushi gliding by you on a conveyer belt until you find just the right one that will please your taste buds. That’s what happens with Kaiten-style sushi. On Tuesday, West Hartford diners will be introduced to this innovative style of dining when Umi Sushi + Tapas opens. Umi is the state’s first conveyor-belt sushi restaurant, a fast-food style option for sushi lovers, where color-coded plates travel on the conveyor belt and customers can choose what they like off the belt. “Dining at a Katien style sushi restaurant offers a whole new dimension to an evening out. It’s an opportunity for people to enjoy delicious food in an interesting environment,” head chef, Kohei Kishida, said in a news release. You’ll not only find spicy tuna rolls and rainbow rolls, but also vegetarian sushi, miso soup, cooked entrees, green tea ice cream, cheesecake and more. There was a soft opening on Monday night and Umi opens at 11:15 a.m., according to its Facebook page. You can check out the menu for yourself here.